We took our usual ten minute journey to our morning dive site, this time, Kuda Rah Thila in South Ari Atoll. The boats rarely travel at night, thus our morning dive is generally positioned near the afternoon site we dove the previous day. This Thila had other small pinnacles next to it, so it made for nice wide swim throughs and was quite different from our continuous reef circling. The reef offered some lovely soft coral and sea fans with a profuse amount of marine life. We descended upon schools of blue striped snapper that rested beneath the coral ledge in a light current. After rounding the corner and swimming through a lovely formation, we found a flatworm and a free swimming eel. We followed the free swimming eel between the pinnacles to find a clam, a grouper hiding under the coral and protective clownfish, but not as protective as the nearby damselfish. Rootie was nice enough to lend me her camera at times, as we are interested in different marine life, and as I went to set my finger down to steady myself while snapping a photo, the little sucker came darting out and bit me. Startled, I jerked my hand away, carefully took the photo of the nudibranch and gave the camera back to Rootie. In the process, I had noticed the grouper tucked deep beneath the coral. Knowing she likes pictures of their eyes and lips I pointed the grouper out to her. She went in for a photo, placing her finger down to steady, and that damselfish came darting out again. It bit her in the middle of her finger just where it bit me! As she jerked her hand away, I flooded my mask from laughing so hard. That little fish was protecting a bigger area than I thought. We were down between 60-80 feet for quite a while, so it was time to ascend to shallower water. An extremely strong current rushed over the top of the reef. While kicking, we stayed in one place. With the sunlight shining into the shallow water, fish zig-zagging into the current and divers bubbles coming up from beneath the coral below, hovering above the top of the reef was lovely! I could have stayed there all day watching the clownfish and the eel, but some of us were low on air, so we had to make our safety stop slightly off the reef where the Dhoni could retrieve us. We motored east past beautiful waters to our next stop, Miyaru Kandu in Vaavu Atoll. We were hoping for incoming current into the channel in order to see sharks. Unfortunately, the Maldives is in a transition phase, so the currents are far from predictable, and we arrived to an outgoing current. With an incoming current, we would have dropped to the channel floor, hooked in and watched the big sharks swim around. With the outgoing current, we still had this chance at this particular dive site, but we didn’t see much below us, so we kept swimming. We were in the Maldives with virtually no moon, and sometimes I think that makes a difference as when I have been on trips during a full moon, animal life has been abundant. After swimming across the channel and only spotting three white tips circling the bottom, we turned into the current and swam a while longer without being able to rest to get to the reef. It seemed like most of the reef was dead along the wall. There was not much to see until we ascended over the top of the reef. A porcupine puffer tucked itself into a crevice. There was probably an eel somewhere along the way as I feel like we have seen at least one eel and one shark on every dive. And of course there were array of reef fish, but Rootie had the camera and obviously not much seemed appealing to her given our only picture for the dive was of a unicorn fish playing in Julie’s bubbles! After that dive, some of us were debating wether we wanted to go on the night dive. I suppose I was inclined to skip the dive more than others as I prefer being able to see beyond where my flash light is pointing. Fortunately Dustin knew that Alimatha Circus in Vaavu Atoll was one of the signature dives for the Maldives. After hearing that, I was game with FOMO (fear of missing out)! Alimatha Circus is known for the sharks and rays that once were attracted to the area by Italian fisherman who would toss fish leftovers overboard. Now dive operators chum the water. 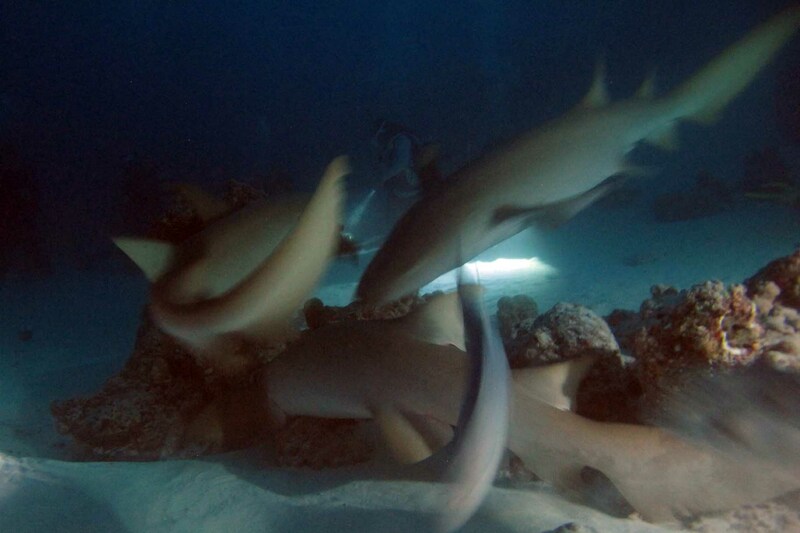 I’m not terribly fond of chumming, but from listening to the dive briefing and later watching our divemasters, they carefully squirted a “fish soup” beneath certain rocks which attracted the nurse sharks and rays as opposed to just tossing fish pieces all over the place. I was expecting to descend to the sandy bottom, form a circle with our group, and then wait for the sharks and rays to join us. As I was descending, however, I could already see sharks swimming below. Little did I know a giant ray was coming toward me as I was dropping. If you can jump a foot underwater, I did as it glided inches beneath. Just as I regrouped to follow Akko to the bottom, a shark did the same thing to me! Akko kept waving me down, but I motioned he’d have to wait for the shark to get out of the way. On the sandy bottom, Rootie and I picked a rock to hang on to. Akko kept motioning for us to retreat, so reluctantly we inched back on the sandy surface unknowing of what was about to happen. We settled in our spots as another set of divers arrived at the bottom. Despite their divemaster pointing the group to an ajoining location, one girl from the group swam right to the rock and parked herself in front of me and Rootie. I tried to motion to her that she needed to retreat, but she ignored me so Rootie tried pushing her back. She elbowed herself next to that rock until the divemaster picked her up by the top of her tank and dragged her back into the circle we had formed! The reason this location turned out to be so important was it was the rock the divemasters were chumming. There needed to be at least five feet of space for the sharks and rays to visit! Six to twelve foot sharks gently yet also cumbersomely filtered their way to the rock that they ferociously sucked. Their tails swung back and forth hitting us in the legs occasionally. They passed through every opening available…between divers, over the top, and even underneath. The rays glided in too, lightly grazing us with their giant wingspans. I was unenthusiastic about the ray’s tail with all its barbs resting on my leg, but I knew they were not there to hurt us. It was a controlled frenzy at times with seven sharks sucking on this rock at once. Evidently, if they turn upside down, their throat opens and they have better results, so they were pointed in every direction. Occasionally the sharks and rays sucked on us too. I hear that sometimes there can be up to 100 sharks. I felt content with the amount that joined us. I also feel fortunate that the current was virtually non-existent as we had a relaxing experience on the bottom. I’m told the sharks are far less delicate when they have to work against the current and are far less aware of there proximity to divers. Great read and pics Beth. The Maldives is not a popular place to go to because it is so hard to get to. We flew to Sri Lanka then Maldives. I befriended a clown fish (I guess) that would swim up to water’s edge and take bits of bread out of my hand.